I have been blessed with being able to chase storms since 2009. 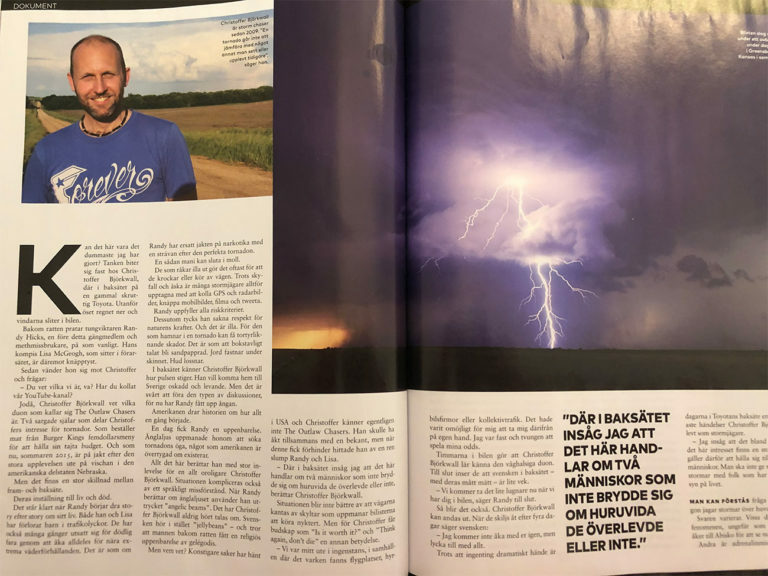 As I live in Sweden where this is almost unheard of and as I have been very eager to share my photos and stories through channels such as StormChasingUSA I have been contacted numerous times by different types of media to talk about storm chasing. I have appeared in Russian online-TV, Ukrainian newspapers, been offered a radio interview with New Zealand public radio but mainly talked about storm chasing in Swedish media – in some of the major radio channels and newspapers. I love talking about this passion of mine, and try to make people understand why storm chasing is such a spectacular thing to do! Earlier in October I was interviewed by Café Magazine, one of the major Men’s magazines in Sweden and the interview was recently published in their last issue. Having had my story told by others many times I must say that the writer, Andreas Utterström, did an exceptional job! He really managed to catch much of the excitement, passion, fear, and fun that I experience by chasing storms. If you happen to be a Swede reading this blog post, make sure you pick up the latest issue and read the article.